I'm a Mormon. "I know it, I live it, I love it--" but, I also have to survive it every Sunday for the first hour and 10 minutes of our church services. Called sacrament meeting, this portion of church worship is arguably the most important part, since it involves the sacred ordinance of the sacrament (much like Communion or the Eucharist). It also requires the congregation to sit quietly in the chapel while we sing hymns, pray and listen to speakers and musicians. Afterwards, the kids get to go to their own program, so this is really the only part they struggle with. Now, I've been a Mormon for my entire life, and as an adult, I'm fully capable of being reverent during sacrament meeting. My kids, though? Not so much. Particularly my younger two, who have very high energy levels. Once we arrive to the church building, about 20 seconds passes before they are squirreling around, trying to escape the pew and causing a general ruckus. And since we're considerate folks, we often end up taking one or both out once they're disturbing others around us. Teaching reverence to children is important, but not easy. Since they differ in age, level of energy and capacity to understand, Dill and I have different expectations for each of our children as they learn this valuable concept. But these ideas are some we've used with great results, and maybe they'll help you, too! 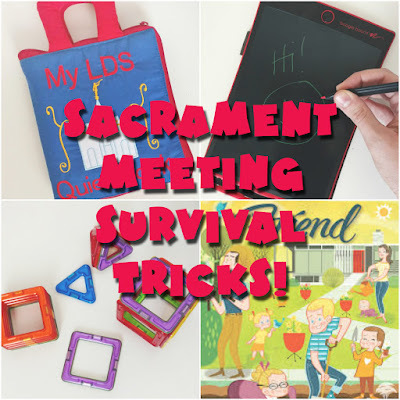 One of the trickiest parts of sacrament meeting is keeping the kids quiet during the sacrament ordinance itself. I don't like to bust out snacks or toys during this portion because I want to teach them to think of Jesus and sit reverently so as not to distract other people with their activities. It's only about 10 minutes long. What I've found to be effective is to search "Jesus Christ" on Google Images and let my antsy kids swipe through the pictures on my smartphone while the sacrament is passed. There are literally thousands of images and many different depictions so they don't get bored too easily. Just make sure SafeSearch is on, because people are freaks sometimes. Last Christmas, my mom bought this quiet book by My Growing Season -- plushy pages with soft features and silent activities -- for Clara, my youngest. Let me tell you, it has been a game-changer! It's just about the cutest thing ever, and Clara loves it. It keeps her busy for a good chunk of time, too. We keep it hidden in our church bag during the week so that it's still fun and interesting every Sunday. I also like how it's gospel-themed -- not a must, but great for keeping the focus on spiritual matters. If you're crafty and would rather make your own quiet book, check out this pin from the blog, "And Next Comes L." Any project with "No-Sew" in the title is a winner to me! And this one is just adorable. We used to bring tons of coloring books and a box of crayons to church, but before long, we found out it's quite a hassle. It's super-annoying when the crayons roll down into the crack at the back of the bench and get lost on the floor of the row behind us. Plus, coloring books are bulky and take up too much room in our church bag. We recently picked up one of these Boogie Boards and it's been great! Compact and thin and reusable. What's not to love? The kids can play tic-tac-toe, hangman, or just draw quietly. And with the click of a button, everything vanishes! I don't know exactly how it works (LCD or something?) but whoever invented it is a genius in my book. They're also great for road trips, doctors' visits, and anything that involves lots of waiting. These toys are amazing! Magformers are little colorful plastic shapes with strong magnets in the sides, so you can stick them together to create two- and three-dimensional objects of all sorts. They seem to be the perfect ergonomic size for little hands, too. And they best part is they travel well, because you can stick them all together in a stack that doesn't break apart. This Church publication has been in print for as long as I can remember, and it's always a favorite with the little ones. They now divide the magazine into two sections -- one for older kids, and one for those who are just starting to read. Since I happen to have a child in each of these age groups, it's perfect for our family! The Friend has tons of great stories and articles as well as activities the kids can do. If you would rather not subscribe, you can always download any issue from the Gospel Library app for free. What about you? Do you have any tricks for occupying your kids during sacrament meeting? Let's hear 'em in the comments! Hey Tasha! We always arrive 10-15 minutes early because I'm so weird about punctuality. But, I will say, on the occasional off-week when we walk in 5 minutes early or right on time, they're worse! We also make it a point to sit near the front of the chapel and that seems to help, too. Thanks for your suggestion! When we had a young family, one of our things that we did was to make sure it was better being reverent in the chapel than it was to be in the foyer. That meant that if one of our kids felt the need to go out of the chapel, it was not a fun experience of running the halls with mom or dad chatting with other parents. We would take them in a classroom, and sit them on our laps, wrapped in a bear hug around their chest, and their legs wrapped in ours, and no talking. When they were ready to go back, they got busy books, and the chance to color, etc. It usually only took only once or twice for them to get the message, and we would usually have no more problems. One time my oldest son decided that he wanted to come to my class, instead of his primary class. That did not go well for him, because since he was in an adult class, he had to act like an adult. He had to sit in his chair and listen quietly. No toys, coloring books or other forms of entertainment. I would not even hold him on my lap, or let him lean on me. He was a pretty miserable four year old. Funny thing is that the next week he was perfectly happy going into his primary class. I even offered to let him go with me, and he refused. Go figure. The goal is to make the chapel a good place to be, and more pleasant than any other place they could be. It worked for us. Absolutely! That's why I am willing to bring some "tricks" to church -- because I hate taking the kids out! It means I have to go into a boring classroom wrestle a greased pig in my lap. Ha. Have you seen those Water Wow coloring books by Melissa and Doug? I think they're like $5 on Amazon. Total game changer! Eli only gets them on Sunday too and they are awesome. It comes with this paint brush you fill with water, and you "paint" water on the pictures to make the colors appear. No mess and they're not bulky either.